He was one of the great Imams of jurisprudence. He was a pious, ascetic, truthful scholar who abstained from unlawful acts. He was also sincere, humble, forbearing, and kind-hearted when dealing with people. He had strong faith in Allah and was fearful of Him all the time. He used to frequently recite the Quran. As well as this, he was very generous and used to spend most of his money in charity especially to support scholars, students of knowledge, and poor Muslims. He is the Imam, the Hafith (a title given to whoever memorizes 100,000 Hadeeths), the shaykh of Islam, the jurist and scholar of Egypt. His full name is Al-Layth Ibn Sa'd Ibn `Abdur-Rahman Al-Fahmi. He was born in Sh`aban 94 A.H., 713 A.C. in Qarqashandah, a village twenty-two kilometers from Fustat, Egypt. His origin goes back to Esfehan, Persia (nowadays Iran). In his early years, he started to learn religious knowledge. He was a student of some of the greatest scholars of his time, such as `Ubaydullah Ibn Ja'far, Ja'far Ibn Rabee`ah, Al-Harith Ibn Yazeed, and Yazeed Ibn Abi Habeeb. Since he was young, his teachers testified to his excellence, genius, and sharpness of mind. Al-Layth had high aspirations to learn. For him, learning in Egypt alone was not sufficient. In 113, A.H., he decided to travel to Hijaz to perform Hajj and seek knowledge. He was twenty years old at that time. In Makkah and Al-Madeenah, which were considered the most outstanding sources of religious knowledge in the Muslim World, Al-Layth started to learn from a unique group of scholars of jurisprudence and Hadeeth. Ibn Shihab Az-Zuhari was known as the most knowledgeable hafith and one of the first scholars to write down the Hadeeths of the Prophet , and he was one of Al-Layth's teachers. Al-Layth also received religious knowledge from `Ataa' Ibn Abi Rabah who was the Mufti and Jurist of Makkah, Ibn Abi Maleekah, Nafi` Ad-Daylami who was the freed slave of the revered companion `Abdullah Ibn `Umar Ibn Al-Khattab, Sa`eed Ibn Sa`eed Al-Maqbari, Abu Az-Zubayr Al-Makki, and many others. He remained fond of knowledge and had an unmitigated desire to actively and studiously attend classes even when he reached the rank of the great scholars. When he went to Baghdad in 161 A.H. in order to teach, though he was over sixty five years old, he asked about the house of the great scholar Hushaym Ibn Basheer who was the master of Hadeeth scholars in Iraq. Al-Layth asked Hushaym to send him some of his books to study them. When Hushaym did, Imam Al-Layth started to read through their valuable and priceless information. - A session for discussing the practices of the Sultan of Egypt. Imam Al-Layth Ibn Sa'd attained a high rank and prestigious standing in the sight of the `Abbasid Caliphs to the extent that if the Sultan or the Judge of Egypt committed any wrong, Al-Layth would write to the Emir of the Believers who, in turn, would depose them. - A session for fulfilling the requests of the poor and the needy. The Imam, may Allah have mercy on him, never turned down any request for help. He was one of the most prominent jurists of his time. He was well-known among people everywhere. The caliphs and Emirs came to know him and scholars praised him and testified to his profound knowledge, abilities of memorization, and mastery of religious affairs. "Al-Layth Ibn Sa'd is our master, Imam and scholar." "Al-Layth had profound knowledge and his narration of Hadeeths is authentic." "Al-Layth is more knowledgeable than Malik." He means Malik Ibn Anas, the Imam of the people of Al-Madeenah. Imam Al-Layth occupied several posts. He was the head of the Administration of Finance during the reign of Salih Ibn `Ali Ibn `Abdullah Ibn `Abbas of Egypt. He was also its head during the caliphate of the `Abbasid Caliph, Al-Mahdi. 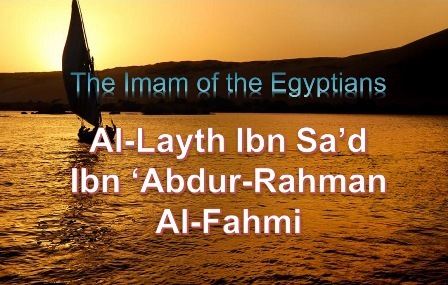 Previously, the `Abbasid Caliph Abu Ja'far Al-Mansoor asked him to be the ruler of Egypt, but Imam Al-Layth refused. Imam Al-Layth Ibn Sa'd was an authentic narrator of Prophetic Hadeeths and a talented jurist. He was known for his piety, asceticism, and generosity. The Imam was one of the wealthy scholars. His son Shu'ayb said that his annual income was between twenty and twenty five thousand Deenars (golden coins). He used to spend all this money in the cause of Allah. He was never liable to pay Zakah, simply because he would spend all his money before the year had passed. Imam Al-Layth used to give out charity to three hundred needy people every day. He never ate his food except in the company of people. One day, a woman came to him and said: "O Abu Al-Harith! My son is sick and he craves to eat honey." "Give her one hundred and twenty pounds of honey." Imam Al-Layth was very generous with scholars, to the extent that he used to send one hundred Deenars to Imam Malik Ibn Anas every year. Once Imam Malik wrote to him that he was in debt. Imam Al-Layth sent him five hundred Deenars. When Imam Al-Layth went to perform Hajj and he passed by Madeenah, Imam Malik sent him a plate of dates. Imam Al-Layth Ibn Sa'd put one thousand Deenars on the plate and sent it back to Imam Malik. When the books of Ibn Luhay`ah, a great jurist and narrator of Prophetic Hadeeths, were burnt, Imam Al-Layth immediately sent one thousand Deenars to him. Imam Al-Layth Ibn Sa'd died on Friday, the fifteenth of Sh`aban 175 A.H., 791 A.C. He was buried in Cairo and his funeral was attended by a large number of people. The people were very sad and consoled one another.